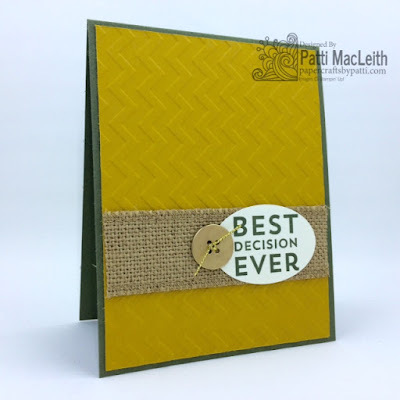 Papercrafts by Patti: Best Decision Ever--Retirement! A friend is retiring from law enforcement after 30 years with our county. There's a party tonight! I made a card for him that has some of the colors of the uniform he wore. 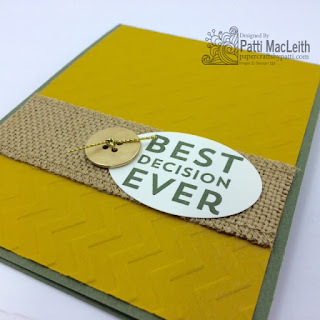 The card base is Always Artichoke, a color I rarely use. I added the Chevron textured Crushed Curry and used burlap ribbon and a gold button and cording for a fancy touch. The chevrons remind me that he achieved the rank of Sergeant--kind of like those patches they wear. The gold is just a fancy touch. There are gold and yellow accents on the patch with our county emblem. I'm so glad you stopped by today! Let me know how you like this card. I hope it inspires you to get out your supplies and stamp! When you need Stampin' supplies, please use my Online Store any time.